This is my weekly journal quilt 50/52 2008, 6″ x 8″. WOW! We are nearing the end of the year quickly, sorry for the many catch up postings of journal quilts the last couple of weeks. I’m headed away from my keyboard for a bit, so I’m just getting things in order! This piece is really silly, but I still really like it. I have created pounds and pounds of scraps this year, and as my studio can attest to, I have difficulty throwing away even small pieces of colorful creations. 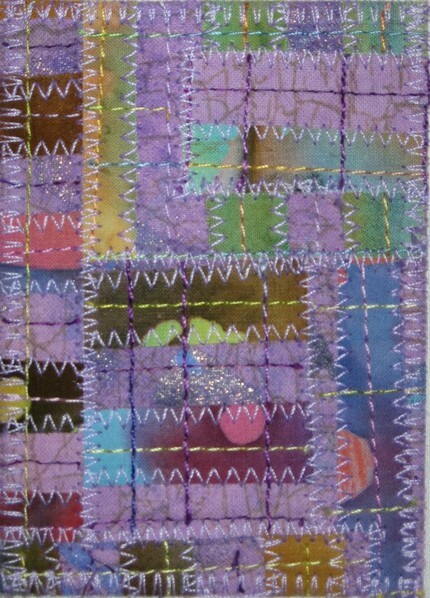 This piece is simply created with edges of trimmed ACEO’s, reassembled quilts, journal quilts, and other pieces I created this year. I narrowed this piece down to a ruling of only yellow, purple, and green scraps. The background is white, as many of the pieces I created this year were backed with muslin so I can sign and label them. It has nice depth to it because the scraps contain either batting or peltex interfacing. After I fused the scraps to the interfacing, I just quilted the piece vertically with lines in a yellow variegated thread. This piece holds memories of a great year of creating in 2008! I started this piece by sewing a brown paper bag with red stamped images on it to a red and white print fabric for the base. I then added red tulle in crossways strips across the piece and sewed them down. Then, the REALLY fun part started! I cut up some treasured red and white coffee cup sleeves from a holiday series that Starbucks did a couple of years ago. I crazy pieced all the little pieces without logos from the coffee cup sleeves together with red zig zag stitches on my sewing machine. When I had a large enough piece to work with, I cut this piece into a heart and sewed it to the based piece. I fused a back on and zig zagged the edges to finish. This is my weekly journal quilt 47/52 2008, 6″ x 8″. This was a really fun piece to make. I had no plan, and just took it as it came. I started with a full cloth background of the yellow batik with limey green spots. I added leftover pieces from cutting the leaves on 46/52 2008. (Those leaves create a lot of leftovers!) Then I cut a sponge in the shape of one of the tiny teardrop shapes on the batik and stamped on the piece with orange paint. I then used an eraser tip to paint green dots on the piece. I knew it needed something else, so I started painting branches in green, which turned into tree shapes. I finished the piece off with quilting in yellow and green variegated threads. I put a plain back on it and zigzagged the edges. My husband says it looks like an underwater view of coral and seaweed, which I can totally see. This is my weekly journal quilt 46/52 2008, 6″ x 8″. This is an exploration of techniques for a larger piece that I am working on. As I have been making a larger version of my journal quilt 41/52 2008, as often happens, I realized the need to make changes and alter things for a larger scale piece. I needed more depth and layers in the piece, so I decided to add MUCH larger sheer leaf shapes on top of the smaller batik leaf layer. Please note, for the purpose of this journal quilt, the brown/rusty sheer, is not in a much larger scale, so that I could actually see more of the play of the sheer layer. I don’t often work with sheers, so I am both excited and nervous. I used this journal quilt to test out my ideas about how to technically work with the sheers and this piece. One the top left sheer shape, I tried using fray-chek on the edges, spray basting it, and putting the yellow quilting stitches over the sheer. On the top right sheer shape, I tried using fray-check on the edges, spray basting it, and keeping the yellow quilting stitches under the sheer, and adding brown solid triangle quilting on top of just the sheer. On the lower right shape, I tried not use fray-chek on the edges, spray basting it, keeping the yellow quilting stitches under the sheer, and adding brown solid quilting on top of the sheer echoing the leaf shape. Up close it was hard to gauge, but from far away, I like the yellow quilting stitches on top of the whole piece, It feels like one more layer and gives it some more contrast. While the sheer isn’t fraying tragically on the leaf without fray-check, I am still going to use it. The zig-zag edge stitching covers up the shininess of the fray chek, and it will give it more durability in the long run. Wish me luck! There’s still time to make or buy handmade for the holidays! I personally enjoy a bit of affordable art like my ACEO above, but I am certainly giving all sorts of other types of handmade items this holiday. This is my weekly journal quilt 45/52 2008. This piece was created by starting with a blank white piece of fabric and making watercolor pencil rubbings with various colored pencils. For the rubbings, I used some cool plastic trays with a nice texture that my sister had that were in her recycle bin. After creating the rubbings, I cut up the plastic trays and glued them to the piece (the shiny strips.) Then I did something silly (I had to. Really.) I glued the plastic down while I was visiting my sister. Then when I got back, I needed to fuse it to the peltex (which requires heat.) I think you know where I’m going with this. I melted the plastic. I realized it immediately and then melted it more to make all the edges a bit rounded and more uniform. Then I stitched the piece all over, finished the edges and voila! Melted art.